Instagram is the most popular social network for the editing and sharing of images, and although the user base continues to grow exponentially, the app itself is far from perfect. Not only could the UI benefit from a makeover, but several options one would perhaps expect from an app of this kind are clearly lacking. The ability to zoom in, for example, is something we can easily do natively on iOS, but when it comes to Instagram, those pinch-in and pinch-out gestures are to no avail. Luckily, a tweak by the name of Instahancer not only solves this particular caveat, but a bunch of other little nagging issues, and we’ll be taking a closer look at how it works it magic after the break. With Instahancer, the key feature is the ability to zoom in on images and also save the images themselves. It’s something nearly all photo apps can do, but for some reason, Instagram has never allowed. 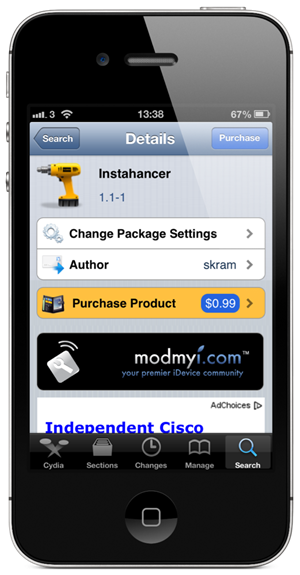 Upon installing Instahancer, you’ll be able to zoom by using the tap + hold gesture, and selecting the Zoom option. From there, you’ll be met with a new view offering a higher resolution image that you can scan in greater detail. Also on the menu is the unique ability to save caption drafts. If you don’t want to go through the tiresome rigmarole of copying a caption, only to have to go through and paste it once again, for a new photo, the Instahancer Save Draft function will keep your caption in memory for precisely when you need it. With a bunch of other features promised by the developer, it is a purchase most Instagram users really ought to make. The tweak costs a mere $0.99 over at the Modmyi repository (default source in Cydia when you jailbroke your device), and once you’ve paid that dollar, you’ll be able to reap all the benefits of any future updates and enhancements offered by the dev. Download it, give it a try, and let us know if it enhances your Instagram experience by dropping a comment via the usual mediums below!